You know how they say that laughter is contagious? Well, I imagine that a kid’s laughter is perhaps the most contagious kind of them all. If you don’t believe me, why not give Gigglebug a try? Gigglebug is a playful app that follows Gigglebug and his friends Barry, Mr. Moose, and the Owl Boys, on their way to a concert at the mansion across the lake. Unfortunately, their boat tips over as they get on, leaving them soaked and upset. To cheer them up, your juniors are asked to tickle them using simple touchscreen gestures. As you play with the animals, you will soon find that they have special “tickle spots”. Tickling outside these spots won’t make them laugh, but instead will keep them grumpy. There are three spots for each animal, denoted by colorful balloons on the top of the screen. As you successfully locate each tickle spot, the animal’s mood is slowly lifted and laughing bubbles are produced. These bubbles will slowly inflate the balloons on the top of the screen, one at a time. When all three balloons are filled, your job is done and you can move on to the other animals. Gigglebug is free to download. This initial download includes includes Gigglebug, and a one-time in-app purchase of $0.99 is required to unlock a proper story, three additional animal friends to tickle, and a free-play interactive musical scene. In the musical scene, you can touch on the members of the Pinecone band as well as Gigglebug and his friends, to play a cheerful tune. The band plays many instruments, including harp, bass, guitar, flute, and accordion. You can tap to turn on as many instruments as you like at a time. 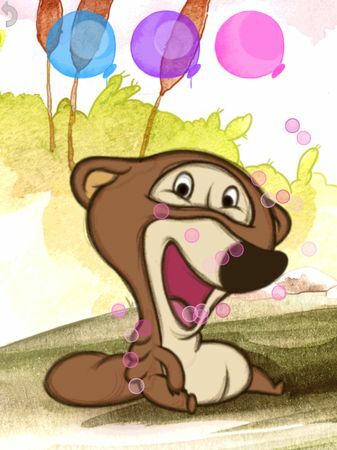 Gigglebug is a funny app that encourages juniors to laugh and play with animals. Using simple touch gestures, juniors try to solicit laughter from sad animals and make them laugh again. Because of its simplicity, the app is more suitable for young juniors, i.e., three years old or younger. As an app for young kids, the app has no timer. It also doesn’t give out penalties, although the animals will grunt in annoyance if you tickle them at the wrong places. If you like the Gigglebug app, it is interesting to note that the app creators are also releasing a TV series. 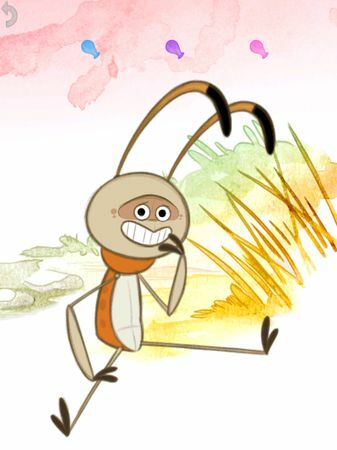 According to the Gigglebug website, each episode is 5 minutes long and is where “humor and positive thinking helps Gigglebug and other forest creatures overcome challenges of growing up.” The first episode is scheduled to air in Finland today, June 15, on YLE TV2. More countries are to be announced soon. Much as its name suggests, Gigglebug is a cute app that will infect kids with giggles. The idea is unique, and I have to say that the presentation is also pretty solid. In terms of presentation, the app features beautiful, watercolor illustrations with an earthy color palette that gives it an endearing quality. The characters are adorable, and the animations smooth. Another thing that makes the app work well is the quality of audio files included. The narrator is clear, lively, and helpful. Each animal is given a distinctive laughter, but they are all delightful to hear. I like how the animals’ quiet giggles slowly turn into boisterous fits of laughter as you discover more and more tickle spots. Gigglebug is a cute app with an adorable cast of characters, lovely artwork and animations, and an infectious gameplay. Despite its simplicity, I think the app is great for young juniors. If you just love seeing your juniors burst into giggles, then this app is definitely for you. Sago Mini Forest Flyer. A playful app that encourages toddlers to explore and play in the forest. Kids Sounds. Musical toy introduces kids to a world of sounds.